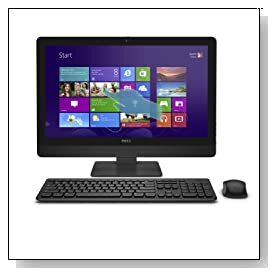 Slim and modern Dell Inspiron i5348-5555BLK is a powerful 23 inch All-in-one touchscreen desktop for work or entertainment with a 4th generation Intel i5-4440S processor, 8GB memory, 1TB hard drive. It is actually the highest model of the Inspiron 23 5000 series- a great All-in-One PC desktop for overall performance, functionality, looks and value for money. The i5348-5555BLK comes with a quad core Haswell Intel i5-4440S processor (6M Cache) at 2.8GHz speed- up to 3.2 GHz speed, 8GB (2 x 4GB) Dual Channel DDR3 SDRAM at 1600 MHz for very efficient multitasking of just about anything for work or play, 1024GB = 1TB SATA hard drive at 5400rpm as a very large storage space for all your photos, songs, movies and regular files and 64-bit English Windows 8.1 operating system.. With the powerful i5-4440S processor and plenty of memory, you can easily multitask- use social media, send emails, listen to songs, download a video and more at once with very little or no delay. The system is also reported to start up very fast. Large Full HD 23 inch responsive 10-point multi-touch LED backlit Anti-Glare display with 1920 x 1080 pixel resolution that supports multiple gestures- tapping, swiping, pinching, scrolling and more and Intel HD Graphics 4600-great picture quality for when you’re editing photos or watching movies. In terms of games capabilities, you’ll be restricted with the Intel integrated graphics card and not having a dedicated mid-range or advanced card but you can still play some of the more current titles at lower settings. Capacitive touch function with under-glass sensors is highly accurate for smooth movements on the edge-to-edge screen to use comfortably with the latest Windows 8.1 operating system. Dell Inspiron All-in-One has a rather elegant design with a single cord that will make it stand out in any room of your house, although it is not an iMac in the looks department. You have a lot less clutter and a lot more space left on your desk with just the power cord that goes through the rear of the screen and the measurements of 27.38 x 10.80 x 19.13 inches- no tower as everything is built into the screen except for the wireless keyboard and mouse. Screen will be fine on a solid desk or table or on the wall with the VESA mount that you need to purchase separately. For great audio, it comes with the Grammy Award-winning HD Audio Waves MaxxAudio technology and stereo speakers- sound is more than satisfactory. 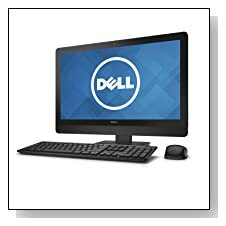 Connectivity options include Dell Wireless-N 1707 802.11bgn wireless, Bluetooth 4.0 tied to wireless card, an HDMI in and an HDMI out port, 5 x USB 2.0 ports, 2 x USB 3.0 ports, Tray load Multimedia DVD Drive, 4-in-1 Media Card Reader, FastAccess Facial Recognition, Dell English wireless keyboard and mouse bundle and a HD webcam- Mouse and keyboard could have been nicer- they don’t have a premium feel but that can be easily upgraded. Conclusion: Dell Inspiron i5348-5555BLK is great to look at, is easy to set up (comes with Cyberlink Media Suite Essentials, 30 day trial versions of McAfee and Microsoft Office and nothing much in terms of pre-loaded software that would potentially annoy you), a large 23 inch FHD touchscreen which will make the Windows 8 learning curve shorter than normal, lots of storage space and system memory, a very capable CPU, a 1 year In-Home Warranty and Dell's best customer service. By looking at its features and specs, hard to beat this AIO desktop especially for its price. It would have been nicer to have a more advanced graphics card than the integrated HD 4600 for gaming purposes or you can upgrade your graphics card to something mid-range or high-end- which may cost an easy 3-400 dollars but it is quite capable to handle anything other than these games and very demanding graphics software.